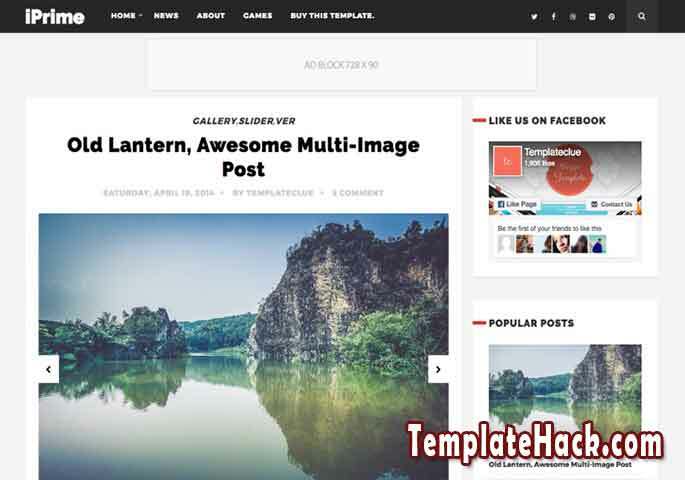 TemplateHack.com - Download iPrime premium blogger template. iPrime is awesome magazine blogger template. I will share a free premium version od iPrime to you. Install this clean blogger theme to your any niche blogspot topic. It will be suitable for applied on lifestyle blog, travel blog, photography blog, gallery blog, magazine blog, news blog or reviews of place. iPrime has a simple design to make your visitor enjoy to visit your blog. Download the template made by templateclue for free by clicking a download button here. Ads Ready, Breadcrumbs, Browser Compatibility, Customizable, Drop Down Menu, Email Subscription Widget Ready, Fast Loading, HTML5 Valid, Mobile Friendly, Page Navigation Menu, Post Thumbnails, Responsive, Slideshow, Slider, Social Bookmark Ready, Clean, Unique, 1 Right Sidebar, Black, Red, White, 2 Columns, 3 Columns Footer. Beauty blogger template, Daily Blog blogger template, Fashion blogger template, Food blogger template, Gadget blogger template, Lifestyle blogger template, Magazine blogger template, News blogger template, Personal blogger template, Recipes blogger template, Reviews blogger template, Tech blogger template, Travel blogger template, Technology blogger template, Viral blogger template, Retina blogger template.